We were thrilled to have Cyclist Aus join us on our November 2018 Vic Alps Cycle Tour! 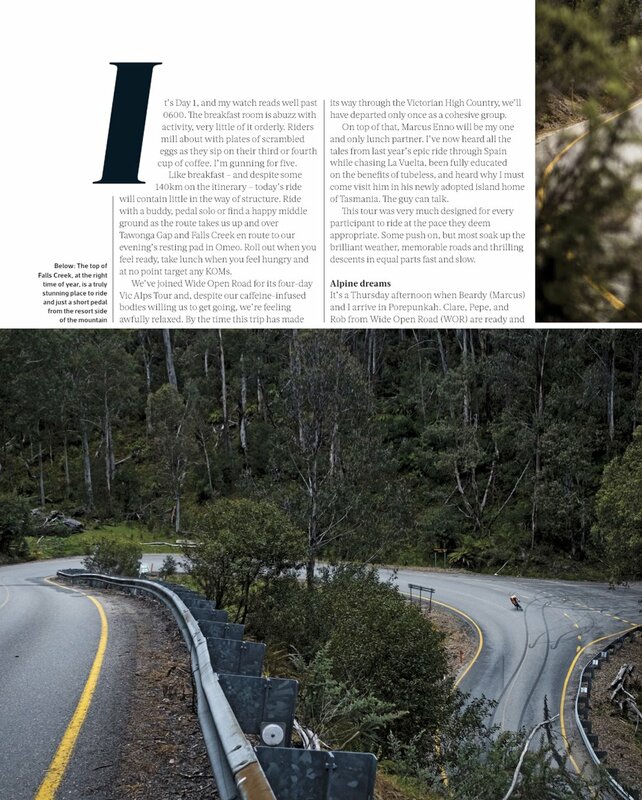 Top cycling photographers Beardy McBeard and Bob Barrett cycled with us for the four days and captured the tour with beautiful imagery and wording that appeared in the March 2019 edition of Cyclist Aus mag. Check out a few of the pages below and make sure you head to your local newsagent to pick up a copy! And of course… we’re running this tour again in November 2019, so if you like what you read and see - join us! We too, can’t wait to get back to the beautiful Victorian High Country! To fuel our bodies, we stuck to the WOR model with a foodie-focus: high quality local produce inspired afternoon-teas, a gourmet picnic lunch & wine degustation dinner at Feathertop Winery to make sure our riding was rewarded with all of the wonderful food and wine of North East Victoria. Check out some of Beardy and Bob’s beautiful photos below and if you’re interested in joining us in 2019 on our Vic Alps Tour - register online! We’ve just come back from an awesome 4 days cycling in Victoria’s High Country as part of our Vic Alps Cycle Tour! The weather was perfect, cycling sublime, beers cold and to top it all off we had Beardy McBeardy and Bob Barrett Photography along for the ride to capture the whole thing for Cyclist Magazine Aus. A group of 17 in total - we conquered 4 of the 7 Peaks Ride Climbs over 4 days: Falls Creek, Dinner Plain, Mt Hotham and Mt Buffalo - as well as Tawonga Gap for good measure! Photos on this page all thanks to Beardy and Bob! Thanks to those who joined us - it was great to have along WOR regulars (Rocket and the “Jerilderee Gang”!) as well as meeting some great new people from around Vic and NSW. A big shout-out to Zoe who conquered her first ever true mountain climb (and managed to tick off all 4 over the weekend and made it looks easy!) and Ryan who came without any training in the hills and rode (most of the way) with a huge smile on his face! Beardy nearing the top of Hotham! Thanks Bob Barrett for the pic! 24 cyclists, 2 weeks, 1000+km, 18,000+m altitude, famous climbs, Le TDF & over 360 croissants! It's been the ride of a lifetime from the Mediterranean to the Alps! 24 cyclists rolled out of Nice along the Promenade des Anglais - farewelling the coast and climbing in to the hinterland of the Côte d'Azur. We cycled the spectacular Verdon Gorge, rolled through lavender & sunflower fields (dodging bees!) & drank crisp rosé in Provence's honey coloured villages. We enjoyed a group lunch in a Provençal auberge, hidden deep in the Luberon mountains and then relaxed by the pool on Rest Day in the spectacular hilltop village of Gordes. With fresh legs we set off in perfect conditions and conquered the Giant of Provence - Mont Ventoux! We pedalled in to the Alps and climbed the classic French Cols - the Bonette, Vars & Izoard to arrive in Briançon and join the street parties as France won the World Cup! We continued over the epic Col du Lautaret and Col du Galibier before a final rewarding ride over the Col de la Croix de Fer to climb the 21 hairpin bends to Alpe d'Huez! We stayed in a private chalet and joined the party atmosphere of the Tour de France on Alpe d'Huez & the Stage Start in Bourg d'Oisans. As always, food was a huge feature - from afternoon teas under the WOR marquee (with plenty of 1664) to local bistrots and degustation dinners with our own private Michelin chef! It was sad to say "Au-revoir" to the group - we'd become a close group of friends by the end - and we celebrated hard on our last night with DJs Chivers & Marasco keeping the party going! Thanks all for a wonderful tour - and a huge thanks also to our 2018 N2A Crew who ensured that our bikes kept rolling, our luggage was transported, we ate delicious local produce inspired afternoon teas & of course that the beers were cold at the end of the day! Rising from the Rhone valleybelow, a real mountain standing alone and crowned by its bare white summit, Mont Ventoux has such striking physical presence and historical significance in the world of cycling that I could do nothing but look up at it with great respect. I had spent a couple of weeks cycling across Southern France as part of an organised tour. 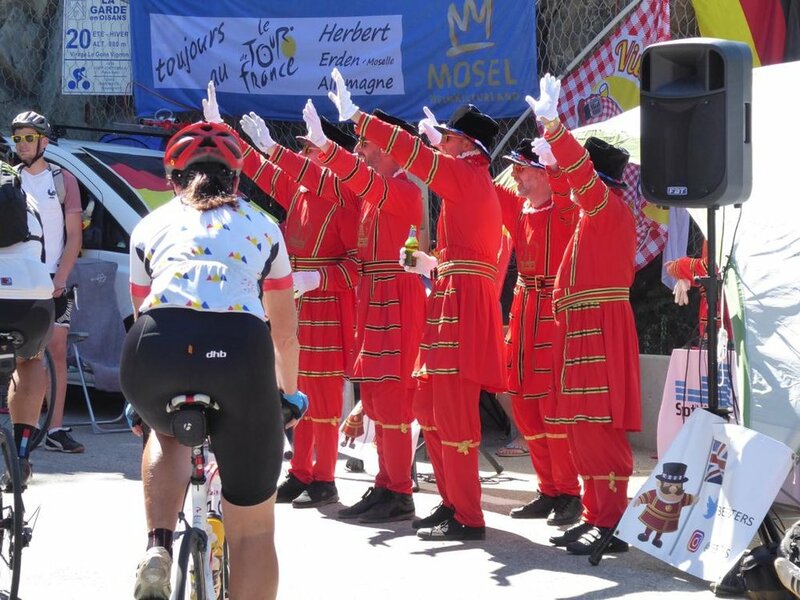 The trip was any cyclists dream ride – quiet winding roads, vineyards, chateaux, honey coloured villages, local markets, prehistoric caves, long lunches with carafes of rose, medieval pilgrim towns, sunflower fields and indulgent dinners. But one of the most anticipated days was the ride up Mont Ventoux. The mountains and mountain passes of the Alps and the Pyrenees have become the Holy Grail for cyclists since they were added to the route of the Tour de France in 1910, 7 years after cycling magazine editor Henry Desgrange organised the first Tour in 1903. The mountain stages in the Tour de France are often where the race is won or lost, and they have come to define the event that is France’s national sporting obsession. The mountains are legends in themselves, and names such as Tourmalet, Col d’ Aubisque, Alpe d’ Huez, Col du Galibier and Mont Ventoux create feelings of awe and respect in cyclists. The views are spectacular - if you have the energy to appreciate them! Mont Ventoux is the last bulge of the Alps before the Mediterranean 100 kilometers to its South. Its 1902 meter high summit can be seen from hundreds of kilometers away throughout Provence, rising up from the flat dry planes and vineyards that surround its base. Mt Ventoux is considered by many cyclists as the toughest mountain to cycle in the world, due to its 22km length, harsh climate and steep gradient. The top of the mountain is a treeless lunar landscape that provides no relief from the weather. On a hot summer’s day, the last 7 kilometers can be brutally hot and still. The sun bears down oppressively from above, reflects off the bare white rocks from the side and steams up into the cyclists face from the tarmac below. It can make any cyclist feel like they are pedaling in a solarium. But when the famous mistral (strong North-West wind) gets going, it can blow a cyclist off his bike! I had heard stories of cyclists pinning themselves to the ground and pulling their carbon frames tight to their chest to stop them blowing away. Record speeds of 320 km/hr have been recorded at the summit, the windiest place on earth! The locals are superstitious about the mistral (‘the master’ in Provencal), and claim they can predict it by feelings of dejection and depression. But it is also attributed to part of the beauty of Provence, blowing away the coulds and smog and bringing rich colours and crisp air. On a blisteringly hot day in July in 1967, Mt Ventoux claimed the life of one of Britains most famous cyclists. Tom Simpson was nearing the top on the stage of the Tour de France on a blisteringly hot day, when he fell of his bike out of exhaustion. The crowd rushed to help him and his final words were “Put me back on my bike.” – he cycled a few more meters and had a massive heart attack. Partly attributed to amphetamines but undoubtedly confounded by the harsh climate on the treeless mountain and the absolute exhaustion any cyclist feels to ride it, let alone race it. So, after an energy laden tart au framboise in the township of Bedoin at the mountain’s base, I set off on the 22 km climb. The initial 4 kilometers are relatively easy, and then the road takes a big turn at the last village and immediately kicks up at about 9 percent as it enters the forest. And it stays that way, with a few kilometers greater than 10%, peaking at 17% for a short distance! There is a short section in the forest where it flattens out for a few hundred meters, but basically it is 10 kilometers of hard, hot, knee-breaking work. Sweat flying off me, face full of heat and jersey drenched it was only stubbornness that kept me pushing, my speed dropping to 7 km an hour for a lot of it. I felt like I was standing still, my tyres just sticking to the ground, the next bend never getting any closer. I tried to think of things other than the burning pain in my legs and lungs, to get into a rhythm to the tunes on my i-Pod. FINALLY I emerged at a few wooden huts and then the restaurant where the tree line officially ends and the road begins to zig-zag its way up through the bare white rocks to the huge summit tower that looks like a space station. There are brilliant views to a misty valley below, although I was mostly too tired to look. I made a pilgrimage to Tommy’s memorial and pushed through to the Summit in a little under two hours. I’d done it! I’d cycled the Giant of Provence. A killer, but a ride that is an achievement just to get there! A hot and sweaty Clare with crew member Paul on her most recent ascent of Mt Ventoux as pat of Wide Open Road's Nice to Alpe d'Huez cycling holiday in 2013. I finally got the opportunity on the weekend to ride two roads I’ve heard so much about and had on my ‘bucket list’ for some time – Reefton Spur and the Acheron Way, both located near Warburton in Victoria’s Yarra Rangers National Park. It was great to catch up with many familiar faces at Bright for the Audax Alpine Classic Australia day weekend! 7 Peaks at 77? No worries! WOR legend Don - conquered the 7 Peaks and cycled from Nice to Alpe d'Huez! Happy New Year and Happy & Safe Cycling for 2017 from the WOR Crew! Win a trip to see the 2017 Tour de France! Win a trip for two to see the 2017 Tour de France!! Getting your bike ready for Europe! So, you’re fit for Tour….how about your bike?